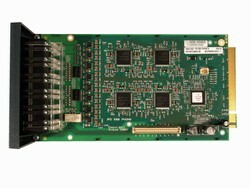 The IP500 Digital Station 8 Card (700417330) provides Digital Station (DS) ports supporting 95xx, 14xx, 64xx, 54xx, 44xx, and 24xx Series telephones plus 3810 and 9040 phones. The IP 500 Office Digital Station card provides 8 extension ports. Terminals can be located up to 1km from the unit using CAT5 cabling (see Handset Cable Lengths).